Paintings in this Gallery represent scenes from the past, especially streets around Wellington in years gone by. Most of the views feature road or rail transport or trams and fashions of their time. Other subjects in this gallery include vintage vehicles found at classic car runs or field days and shows. Scenes from the Past are frequently used to illustrate stories, texts and books of historic interest, usually by reproducing early photographs. Photographs from periods earlier than the mid 20th Century are invariably in black and white and are often quite static. If you have a need to represent a view, or views of the past and old photographs just don't complete the picture, I can use the old photos together with other reference material to bring the scene to life, rearranging the subjects within the scene such as people and traffic to represent the moment of time. To discuss your ideas and needs to illustrate scenes from the past, please contact me. 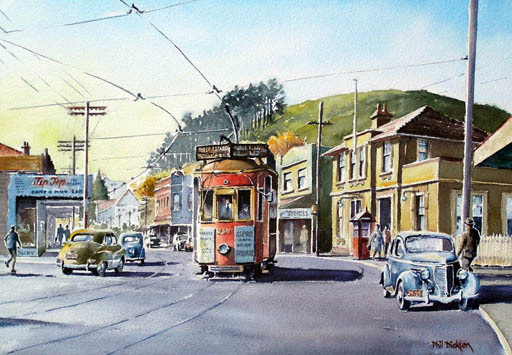 A south bound tram is travelling from the city centre along Mt Eden Road en route to Three Kings during the 1950s. Mt Eden is on the skyline behind the suburban shopping centre. 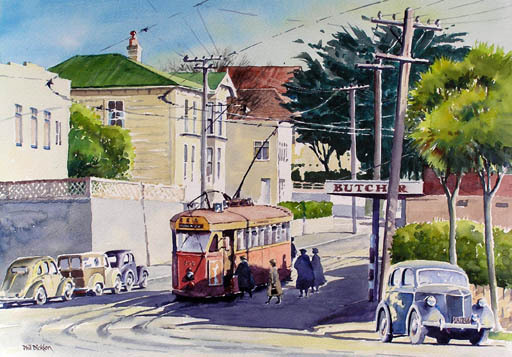 Auckland trams were replaced by buses after December 1956. Flying the Finnish Flag, the Pamir enters Wellington Heads in July 1941. On arrival the ship was seized as a prize of war by the New Zealand Government. From then until 1948 the Pamir sailed under the New Zealand Flag. 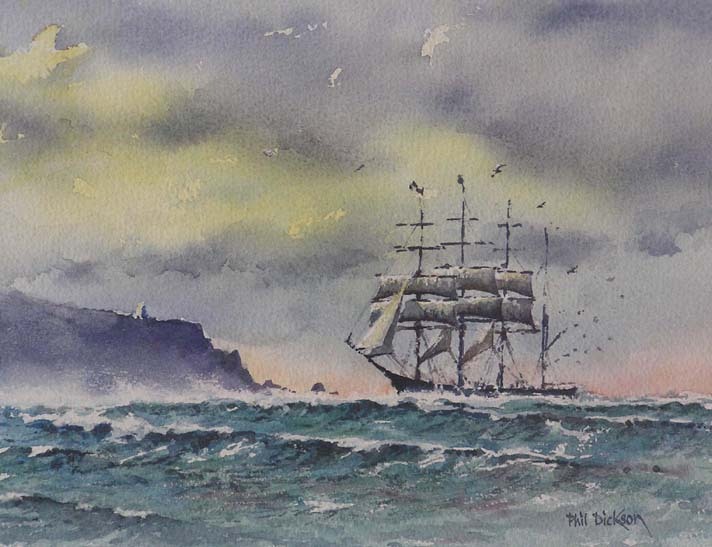 She was eventually returned to her owners, setting sail from Wellington in February 1949 on her delivery voyage home, never to return. 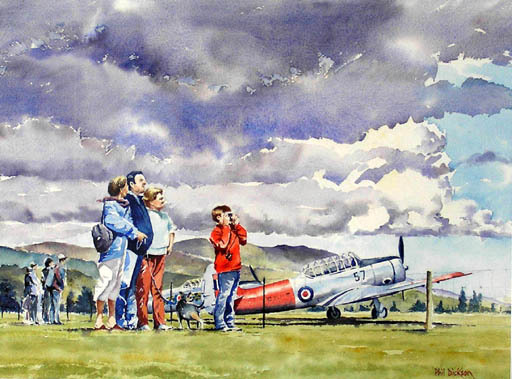 A group of people are eagerly anticipating the fly past of some display aircraft at a recent air show at Hood Aerodrome in the Wairarapa. Behind them are parked several old Air Force Harvard Aircraft. A group of ladies is boarding a tram at its last stop in Karori Road before heading via Chaytor Street for the city centre and beyond one afternoon in the early 1950s. 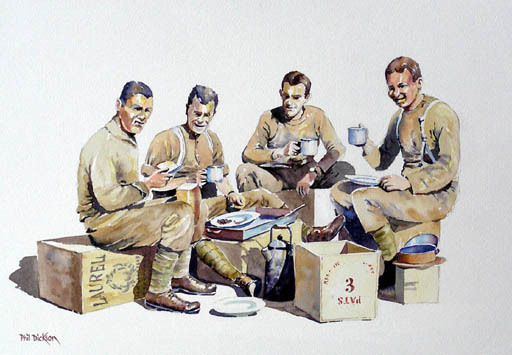 A group of Kiwi soldiers with the New Zealand Expeditionary Force is having a snack and cup of tea while stationed in Egypt during the First World War. 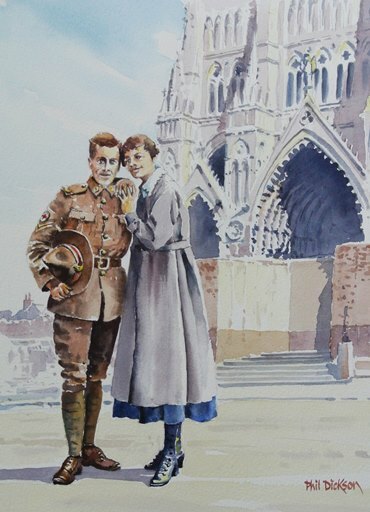 My Grandfather served in France with the New Zealand Expeditionary Force during World War I. I have depicted him with his new French wife in front of the Amiens Cathedral.